I lived in Edinburgh for several years. That festival city, where there always seems to be some celebration of one form of entertainment or another at any one time. But last year I left, pulled to Aberdeen by a curiosity to live somewhere new, and to help my partner explore a new career opportunity. I miss those festivals, but I also miss those hills. I’ve talked about the Pentland Hills before. These hills lie to the southwest of Edinburgh, and are mostly protected as a Regional Park, and rest within the counties of Edinburgh, West Lothian, Midlothian and South Lanarkshire. The spectre of the Pentland hills loom large over the city of Edinburgh. There are a great deal of points within the city where the Pentlands can be glimpsed: a stilled, wild, rural and, perhaps most importantly, remote area. To the city of Edinburgh, these hills are always present, but always at a remove, not quite reachable for most; at least, not without some effort. Still from An Equilibrium Not of This World, courtesy of Katri Walker. and quietness1 is apparent. In Katri Walker’s piece, she explores and gently reveals the way in which a retreat to the hills can manifest itself in the acting of hill running. As the promotional material puts it, it is about: “the dialogue between body and landscape, interior and exterior, man and machine”. The installation shows two projection screens alongside one another. On the right, a path through hills is tracked; a close up of shrubby branches twitching in the wind; a vista of mountains, with clouds floating through the blue sky above. On the left, the right screen’s loose correlates in the form of various analytic sequences and videos that tends towards the scientific investigation of running: stop animation of a runner (presumably on a treadmill in a lab) and a black and white scan of a beating heart; neurons sparking; a plot of inhale/exhale against a graph-paper background. The installation took place in the Edinburgh College of Art, in a darkened studio. I sat on floor, staring at the screens, trying to take in the pair of images; wondering what the intention of the work is, and what it stirs within me. The sonic accompaniment too was significant (and wonderful). It featured music by Judith Weir, which flowed between deep, plaintive bowed strings, to a light, fluttering thrill on violin. In addition, there was the sounds of breathing, and of heart beating, weaving in and out of the music. The slow deep music, racing breath, and on the right hand screen, a view of the hill path, being tracked uphill: the sonic expression of the gruel of a climb. But as the descent begins, so the music changes: this is when it gets lighter, and sprightly, as the run goes down hill; buoyed by gravity: a dance with the landscape. After my third or fourth viewing, the music cuts out. “It does this occasionally, and always at this point!” says the host at the door, by way of explanation. I assume this is a coincidence, though part of me wonders if this is a treat afforded to those who sit through more than a couple of viewings: a chance to have external noise fall away; a chance for my thoughts to come through more strongly. Up until this point, I have been viewing the film from a distance, as an object. Sure, I was trying to imagine my time in the Pentland Hills, and the physical exertion that entails, but all I was doing was calling upon my memories. But when the audio stopped, I suddenly become hyper-aware of myself. I was tired from travelling, and I realised I was shaking to the rhythm of my heart beat. The visual was still present, and my gentle rocking seemed to be a personal expression of the run. It was as though I had transcended that void between viewer and art; as though I had become part of the piece. Not as though I was running, more like my body shaking as the memory of rural exertion was bubbling up through my being (or at least, my-being-there). Gravitated plants – taken by the author. Perhaps that’s what it’s really like? When we’re totally consumed by that moment, that experience, that immersion. After leaving the exhibition, I wandered down the corridor, lost in thought. Facing one wall, was a glass-topped display case. 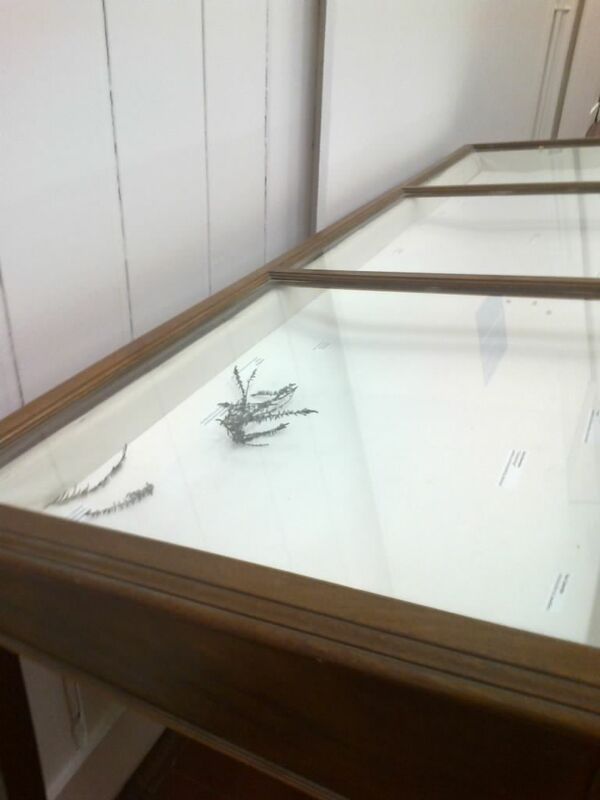 The glass top was angled towards the wall: this cabinet had been rotated through 180 degrees, to minimise its prescence; to show that it was not for viewing: that it was mere clutter; had not been removed in time for Edinburgh Art Festival. The case was almost empty. A white card held taxonomic tags, but most of the specimens that corresponded were not to be found. All that was left were a couple of dried branches, looking like heather or some other woody, scraggy shrub. This case wasn’t meant for viewing, but following my intense focus on Katri Walker’s installation, I was drawn in. That naming and taming of nature, subverted by carelessness; gravity pulling the plant away from its ‘label’: an unintended act against subjugation. 1 Quietness is deliberate, though not perfect. The hills are rarely completely quiet; conversley it’s not impossible to find peace within the city limits. It’s the contrast I’m trying to emphasise here. Originally, ‘thing’ meant a gathering of people, and a place where they would meet to resolve their affairs. As the derivation of the word suggests, every thing is a parliament of lines. Tim Ingold. An enigmatic character if ever there was one. In Lines: a brief history, he highlights the lack of any scholarly approach that focuses on the line as a core of study, stating that he wrote the book: “as an open invitation to join an enterprise” of the study of the line. Such a call has been taken up by curator Euan Gray, the culmination of which is this show: “A Parliament of Lines aims to explore how drawing is being used in current contemporary Art practice. The exhibition seeks to question what constitutes a drawing, at times exploring its boundary with painting, animation and photography” (Euan Gray, in the exhibition’s book). I’ve long been intrigued by Ingold’s work, so perhaps it comes as no surprise that the title of the show immediately drew me in. But while these notions exist in the accompanying video and publicity material, the layout of the exhibition is not so strongly grouped – and so much the better for it. While I was most intrigued by those pieces in the ‘landscape’ section, I was also drawn to Ainslie Yule’s sculpture sketches. Out of the 15 artists exhibiting, it is to four that I wish to turn my attention: Ainsley Yule, Layla Curtis, Graeme Todd, and Sam Griffin. Spiritual Space: Sam Griffin – Bring the Good News, Not Now but Soon; Ruin Value; Zeitbeger (pencil on paper); Huey, Dewey and Louie (pencil and graphite on paper). A recent article on the Cambridge University research pages considered the assertion by archaeologist Dr Susan Oosthuizen that the search for Britishness can be found through our connection to the land – a connection not only through space, but time: old traditions that saw us heft to the land are still reflected in modern practices, be they politics, community, or subversive movements. As I looked at Griffin’s work (before having read the Cambridge piece), I was struck by sense that the ancient, temporally distant, can resonate so strongly. In Ruin Value, we see a tomb, crudely constructed from several upright stone plinths, with a stone plinth roof. No clue is given as to whether this drawing is taken from a real relic, or if merely a construct of the artist’s mind. Either way, there is a mystery to the tomb: who made this? who was it for? is it actually a tomb? But this is not all the picture shows. To the left and right of the tomb, we see two geometric shapes. The left, in particular, shows a Flower of Life, a sacred geometry symbol that has captured the imagination of many, as something that may just hold a key to the mysteries of a spiritual universe and existential meaning. Personally, this is not a thought that particularly appeals to me. But conversely, it is not something I would wish to rule absurd. To me, the presence of an ancient monument next to potentially spiritually loaded geometric patterns speaks of this connection with the land that can tie us back through time. 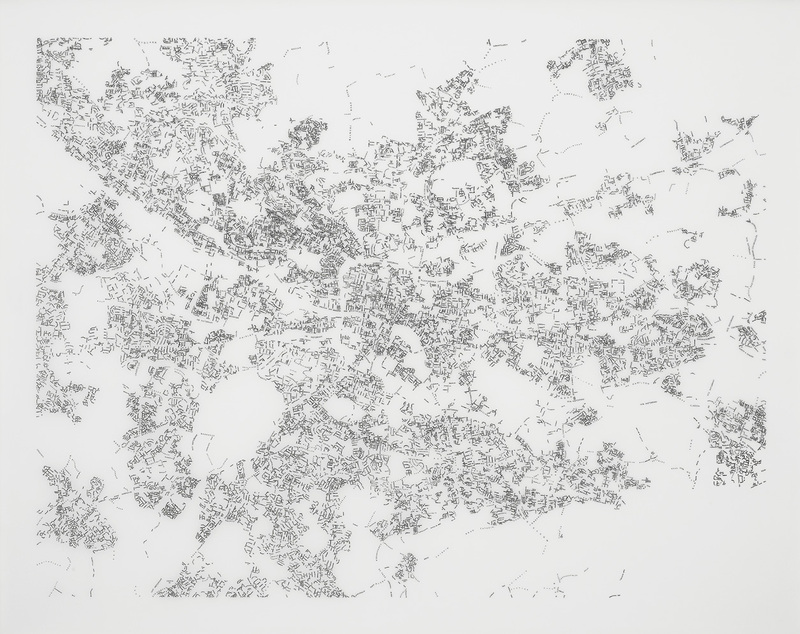 Permeable Places: Layla Curtis – Glasgow Index; Edinburgh Index (ink on tracing paper). These are drawings that are partial copies of Glasgow and Edinburgh street maps. Why partial? The bulk of both cities are shown, yet the partiality is through only showing street names. In a move that initially seems counter to Ingold’s call, all lines in the maps have been removed. But of course, the lack of a solid line denoting the street edge does not mean there are no lines – rather that we are forced to consider what a solid line can come to mean in representation of place. Glasgow Index, Layla Curtis. From the artist’s website. In a world of public spaces and privatised enclosures, we have come to know where we can be – and where we can’t. Yet take away the lines, and you are left with a map of possibilities, not confinement, one of permeability, not boundaries. As I walked through the exhibition, I came first to the Glasgow drawing. I have been to Glasgow a handful of times, but it is not somewhere I know well. I can get about the centre on foot, find suitable transport and roads to get further out, but I lack a comprehensive understanding of how it all joins up. And this was the beauty of the map. Where there are no roads; this map shows no markings. So that huge swathe of largely wordless space snaking through the west of the city must be a river, presumably the Strathclyde. A closer look and one can see the odd road crossing over the river as a bridge, evidenced solely by the street name. The Edinburgh map, on the other hand, had an instant familiarity, mostly from pouring over my OS and A-Z maps. But again, the spaces stand out: the expanse of the Meadows and Bruntsfield Links (besmirched by Melville Drive cutting through); the name-encircled Arthur’s Seat; the possible gap of the narrow and crowded Water of Leith. Everything is possibility, potentiality. 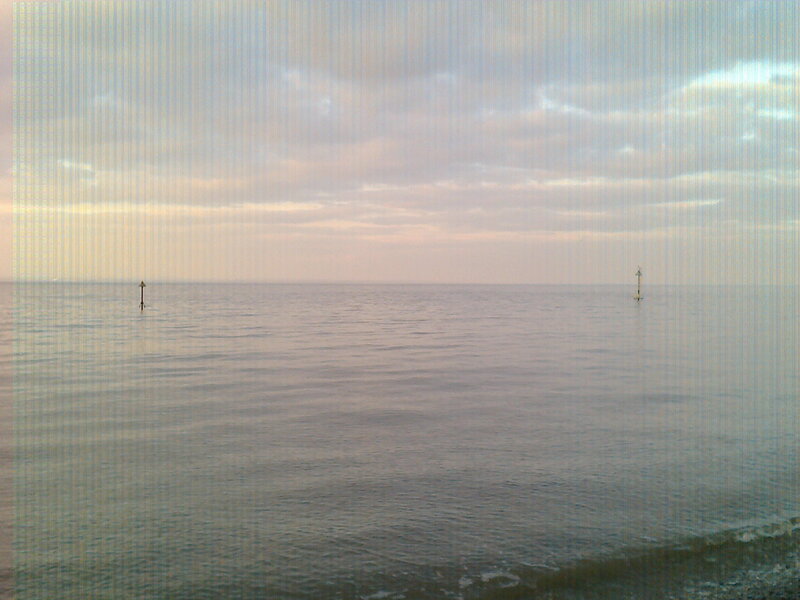 Maybe, we could go further, and present a blank page. No names, no lines, nothing. Just pure, potential experience. As has been said before: “The drawing board is a map with no references“. Sublime Landscapes: Graeme Todd – Mount Washu (acrylic, ink and varnish on canvas); untitled; untitled (ink, acrylic and varnish on panel). Todd’s three large paintings shown at the exhibition feature some of the elements that make landscape painting what we have come to know it as: the topographical features, the trees, the buildings. But not all elements are present. At first look, any three-dimensional perspective is missing. One cannot easily tell what is in front, what is behind. It is as though it is a collage of landscape elements, all shot through with a deep vermillion, crowding in from behind. It is almost as if Kant’s sublime has been abstracted to its extreme, but just short of losing the very recognisability that makes the sublime possible in the first place. Perhaps Todd’s work can take us one step further: didn’t Bruno Latour once say that distance is a myth? I wouldn’t like to go that far. But it certainly seems as if Todd’s work encourages us to dispel the notion of landscape as something only far off and removed; an antidote to the myth of the gaze: in Mount Washu, the house is such a size that it is unlikely to be reachable by hand. But its immediacy stands for itself: it, and everything else in this landscape image, become of the viewer, the abstracted and disconnected elements create a single experience where everything is tied in together; the single-colour wash of the background crossing the boundaries of the lines between tree and cliff, drawing us in, troubling the boundaries between viewer and viewed. People in the Landscape: Ainslie Yule – Structured Wave; Drawing for Sculpture A; Drawing for Sculpture B (pencil and wash on paper). Drawing for Sculpture A and Drawing for Sculpture B seem to be showing physical features of a landscape – perhaps some kind of bank. Drawn onto this is Yule’s sculpture – seemingly of a stepped structure, utilising the form of the bank. While much could be said of the intrinsic beauty of such fine architectural drawing, it was the surroundings to the central point to which I was most drawn. Across both Sculpture A and Sculpture B, there appears a series of smudges – sometimes fingerprints in paint, sometimes tiny ink spills. What are these splodges meant to represent? What are we being shown here? I do not know what the artist’s intentions were, but to me, these smudges represent people. But not the detailed characters one might expect of the ‘artist’s impression’; rather these have no strong definition. These are but fleeting ephemera, the ghosts of the people who have yet to visit the sculpture, should the dream ever be realised. Not people of ponderance, but of transience, drifting through, with no clear line between their body and their surrounds. Interestingly, there happened to be another exhibition showing at the same venue – Art and the Garden. One piece here caught my attention, and goes some way to offering credence to my understanding of Yule’s work. 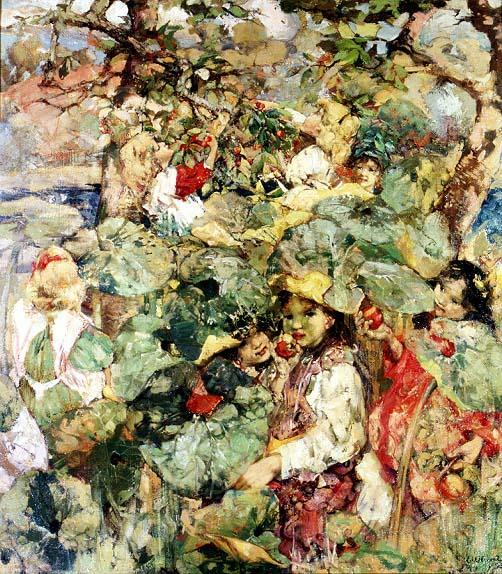 E. A. Hornel’s 1898 piece In The Orchard, in its carefree and slapdash painting, shows Victorian children playing amongst some apple trees. But where does the soft colours of the dresses end and the lush greens and reds of the apple trees begin? Who holds the fray in this scene? Do we even need something to hold the fray? Just what are these Lines of which we Speak? What do walking, weaving, observing, storytelling, singing, drawing and writing have in common? The answer is that they all proceed along lines. So there we have the lines through time of Sam Griffin (and Dr Oosthuizen), the dissolution of the map lines, and the opening up of places of Layla Curtis, the troubling boundary/non-boundary lines of Graeme Todd’s sublime landscapes, and the hard lines of sculpture and their opposition to the blurry edges of people in Ainsley Yule’s work. Lines are everywhere, but lest we forget that lines are not the definition of existence, or of people’s place in the world or landscape. Lines are merely the constitutive meshwork of which we all fall into: like the tapestries around me, where the lines of the thread weave into one another to create a surface, so too do lines of landscape cross-over and knot, bringing meaning, substance and connection through time and space.